Spending a semester sitting in property law. Sound exciting? Well, do you know who owns your spleen? Do you think you do? Well, hang on to it. When John Moore’s spleen was removed during cancer surgery, cells taken from it were turned into a cell line that earned a lot of money for the University of California. Did Mr. Moore own the cells that had been taken from his body? Nope. Did he get any of the proceeds from the Mo cell line – ironically given his name? None. How about the rain? What if, being pretty green, you decide that putting out a rain barrel and catching the rain to use it on your garden an eco-friendly way to go. Great idea? Well, stay east of the Mississippi River. Once you venture into the high desert, things get a little dicey. Colorado would be safe. 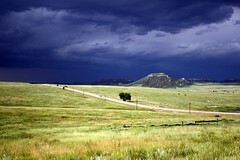 In 2009, the Colorado legislature passed two new laws to make legal what had been illegal since Colorado became a U.S. territory in 1861—collecting rain as it fell from the sky. The laws were needed because under Colorado’s “prior appropriation” water system, every drop of water in the state is owned by someone, and a raindrop was just somebody’s water on its way home. Utah held out longer, but as of 2011, you can take your rain barrel there too. But an Oregon man who built three reservoirs on his land to catch rainwater went to jail last year. He didn’t have a water rights permit from the Oregon Water Resources Department. “Ownership” may sound like a technical concept – and in some ways it is. And defining and regulating ownership is one of property law’s major tasks. If someone can own it, it’s property. But what is property? The mind-bending part of the property course is that the definition is always changing and law is usually running to keep up with science, technology – and the weather. Before the science developed to grow human cells in self-replicating cell lines, Mr. Moore’s spleen would not exactly have been a prize. And when the earth seemed to be full of fresh water, only deserts – like Oregon and Colorado – treated it as “owned” as it fell from the sky. But who owns the water is likely to be one of the great property debates of the 21st century. Japan, with a shrinking population and substantial fresh water, is selling some of its water rights to China. The United Nations recently warned that by 2015, two-thirds of the earth will be “water stressed”. The wars and ecological disasters that our thirst for petroleum brought us (BP is being tried for gross negligence in the Deepwater Horizon disaster as I write this) may pale in comparison to the coming water wars. And speaking of petroleum, the receding ice cap at the North Pole is opening access to parts of the sea bottom that have been encased in ice throughout human memory. The U.S., Russia, Canada, Denmark, Norway and Sweden have all made the claim that their territory extends under the sea into the polar region – rich with, of course, petroleum. Can sensible people of good will make rational plans for allocating the earth’s resources? Can we harness the promises of science without stripping individuals of their rights and their dignity? Ah, well, just another day in property class! This entry was posted in Faculty, Mary O'Connell and tagged Colorado, Education, faculty, Law, Law school, legal education, North Pole, Northeastern University, northeastern university school of law, NUSL, Oregon, property, property law, property rights, Water, water rights. Bookmark the permalink.